Out across the valley the heather is amazing this year. A heart-attack-purple patched blanket pulling itself across the landscape as summer turns to autumn. The hill opposite is a blur as the wind ripples through the bracken, and upturned fronds flash in the sun turning swathes a vibrant silver-mint green. Swallows and house martins curve and twist in the air collecting penultimate leave-taking meals. The last week or so has brought them a final feast of heather flies, and the fly shops in Edinburgh an upturn in sales of bibios and black hoppers. The younger swallows with their shorter tails are difficult to tell, in flight, from the martins. Two young birds perch uneasily in the breeze, wobbling on the telephone wire, their red breasts identifying them as swallows. Out of the valley and heading to the coast, the hills give way to golden wheat and barley fields. Some fields are already harvested, with short stalks left spiking the purple/brown soil and giving a black sheep woolly jumper texture to the landscape. On the coast now, and the streets of Dunbar are Sunday-afternoon slow. A few galleries and gift shops are open, quickly bypassed on the way to the harbour where, out to sea we’ll see three or four small boats out on the reefs hopefully getting a few pollock. Before we get there, though, we stop outside a building on the high street. It’s a neat, three storey white town house. Red roof tiles light up in the afternoon sun. There’s a sign on the wall with a side-on portrait of an old, bearded man. The sign gives us a list of opening times (it’s open!) and is headlined with the words “John Muir’s Birthplace”. Neither of us knew who Muir was, so we head inside. John Muir was born in 1838 and his early life around Dunbar alternated between vicious beatings from his zealously religious dad, and exploring and enjoying the East Lothian countryside. The Scots have always been travellers, spreading out across the globe in all directions; sometimes escaping from empire, sometimes helping to build it. When John Muir was a youngster, his dad (feeling that the Scottish churches weren’t strict enough!) decided to move his family across the Atlantic, initially heading for Canada but changing his mind on route and diverting to Wisconsin. Initially John pursued a technical bent and created a bit of a stir, improving processes and machinery for his employers making wheels for wagons. Then, following an accident at work in which he lost an eye and nearly his whole sight, he resolved to dedicate his life to nature. And what a life! He once walked 1000 miles from Indiana to Florida. He spent years working with shepherds in Yosemite. His writing (300 essays and 12 books) about these adventures soon attracted attention, and Muir quickly became known as one of the first conservationists. He had the ear of presidents (camping and walking with Roosevelt) and congressmen, and was a prime mover in the establishment of the Yosemite and Sequoia national parks. He founded the Sierra Club, still an important conservation organisation in the US. In Scotland we now have the John Muir Trust, helping to conserve parts of the Tweed valley, highland, and coastal areas. 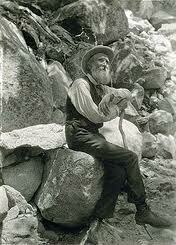 In short, John Muir’s writings and conservation legacy have spanned the globe. And I know he’d still feel the same about the heather and ferns, the swallows and martins, the soil and stubble, the sand and the sea, if he could travel with me, from here, in the Lammermuir Hills, out to his birthplace at Dunbar.